LANSING, Mich. — Protecting Michigan’s natural resources, hunting heritage and wild game just got easier under legislation sponsored by state Sens. Dale Zorn and Phil Pavlov and signed into law by Gov. Rick Snyder. Zorn sponsored Senate Bills 245 and 246, now Public Acts 188 and 189 of 2015. The measures toughen penalties and increase restitution for individuals convicted of the illegal killing, possessing, purchasing or selling of certain animals in Michigan. Under Zorn’s legislation, an individual convicted of illegally killing, possessing, purchasing or selling moose or elk will lose their license for 15 calendar years for a first offense and for lifetime for a second offense. If the animal were a bear or antlered white-tailed deer, the individual will lose their license for five calendar years for a first offense and for ten years for a second offense. Photo caption: Sens. 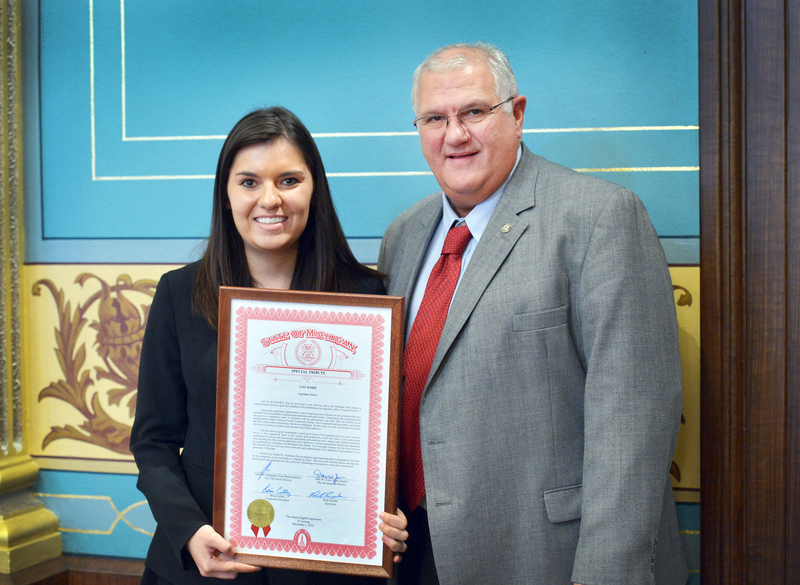 Phil Pavlov, R-St. Clair Township (left) and Dale Zorn, R-Ida (right) hold Senate Bills 244 (Pavlov) and 245–246 (Zorn), now Public Acts 187, 188 and 189 of 2015, after they were signed into law by Gov. Rick Snyder on Wednesday. The new laws increase restitution and toughen penalties for individuals convicted of the illegal killing, possessing, purchasing or selling of certain animals in Michigan. Note: For a print-quality version of this and other Zorn or Pavlov photos, click the image or visit www.SenatorDaleZorn.com or www.SenatorPhilPavlov.com and click the Photowire link under the Media Center tab. LANSING, Mich. — Sen. Dale Zorn and area fire chiefs joined Gov. 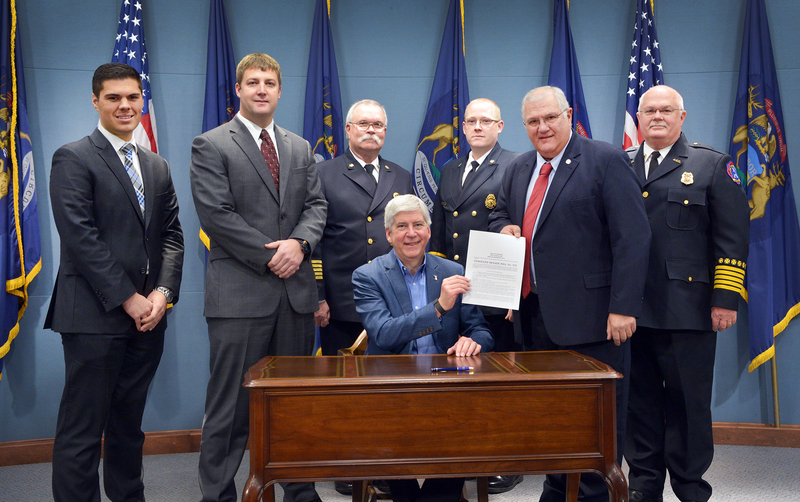 Rick Snyder on Wednesday for a formal bill signing of Zorn’s legislation to provide firefighter certification reciprocity with states that have the same requirements as Michigan. Joining Zorn at the bill signing were Adrian Fire Chief Paul Trinka, Spencer Township (Ohio) Fire Department Chief Carl Arnold and Midland Fire Department Chief Chris Coughlin. 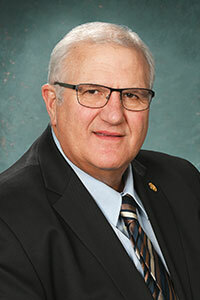 Arnold is a veteran of the Ida Township Fire Department, and Coughlin represents the Michigan Association of Fire Chiefs. Both men testified earlier on behalf of Zorn’s bill. Senate Bill 372, now Public Act 203 of 2015, requires the state fire marshal to extend reciprocity certification to a firefighter from another state who seeks to work as a firefighter in Michigan, as long as the individual was certified in the other state after completing a program that meets or exceeds Michigan’s standards.